For those of you that have visited Turkey before, you shall be aware that Turkey offers the best possible value for money. For those who have not, Turkey is not in the Euro therefore your money goes further. The exchange rate is around 2.30 Turkish Lira to the Pound. 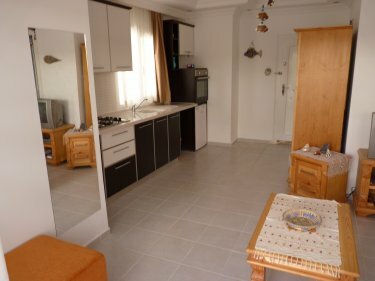 This is a brand new complex and the apartment is luxurious, and furnished by ourselves to a very high standard. We really have tried to make this a home from home, with everything you could possibly need. 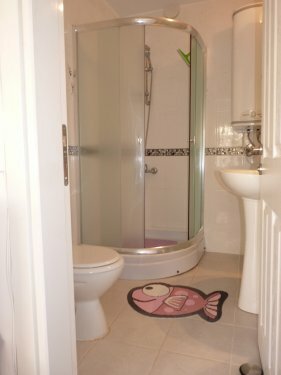 This apartment is within an unspoilt fishing village of Gulluk and is situated within a brand new complex called Rose Garden, 5 minute walk from the town centre, and 2 minutes to the beach. This apartment is fully equipped with aircon. 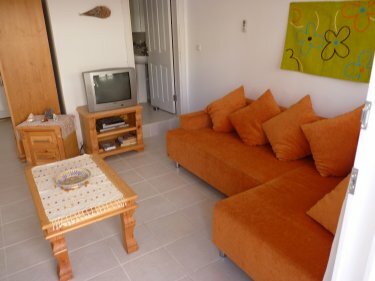 Fitted with full electic oven and gas hob, fridge, TV (with satellite TV), DVD player (plays DVDs and Music CDs)and all the things you would expect for a comfortable and relaxing holiday. 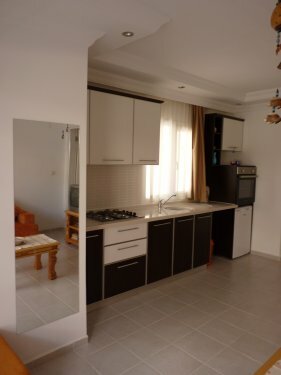 The Studio is of an open-plannned design, kitchen and dining area, including fully fitted modern kitchen and Washing Machine. It has a luxury bathroom with a power-shower. Great sized balcony over looking the Pool. Furnished with table and chairs x 2. The lounge also has a luxurious large double sofa bed. (We have slept on this ourselves and is as good as any double- bed). All the bedding is provided as are all the towels. If your hoilday stay is longer than one week, all bedding and towels will be replaced with clean at the end of the week. At Rose Garden the apartment (A1) is situated on the Ground floor. 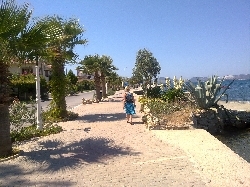 A 5 minute stroll from Rose Gardens is the centre of Gulluk. 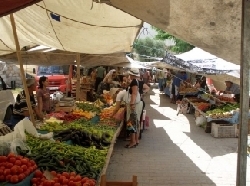 Here you will find lovely little shops, restaurants, supermarket, Banks, Car and moped hire. On a Thursday Gulluk has its own market providing an array of local produce and crafts ( you really have to sample the strawberrys, they are wonderful!!) As in the rest of Gulluk you will find the hospitality second to none! Every day it is possible to witness the local fisherman bringing in their catch, and being able to sample these in the local restaurants. The days are alive with the local people going about their everyday business, and by night a more tranquail and relaxing atmosphere to be found on the harbour side. 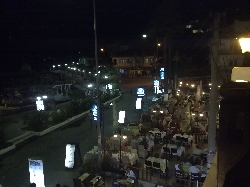 The restaurants and bars serve high quality food within a lovely atmosphere. On the numerous occassions we have visited, we have found a family of 4 can dine with drinks for around �40.00. With such a varied menu of meats, fish and salads the food is delicious! 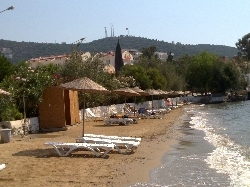 If you should fancy a livelier night out Bodrum is only 20 minutes away by taxi or car. A 40 minute bus ride during the day. 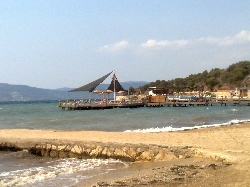 In Bodrum you can find night clubs, bars, restaurants and all major shops, combining the old with the new. 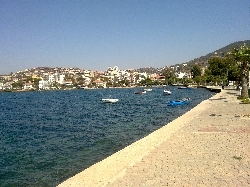 Perhaps a ferry ride to Kos, Rhodes or other Greek Island, just a short hop away. Nearby there is a course named Vita Park, which is starting to get rave reviews from the golfers that have used it. With the great Turkish weather and the idealic sceneary, this course will only grow in stature! A beautiful destination with weather to match. Idealic sceneary, friendly people and great value for money. If you are looking for sky sports and a full English this holiday is not for you. This holiday can be as lively or as relaxing as you wish, ideal for couples, families and Honeymooners alike. We can provide a welcome pack of essentials on your arrival, plese feel free to enquire. Baby items available for hire, ie: Cot, high chair etc..